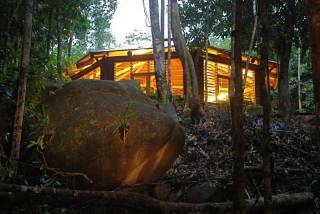 Tea Tree Cottage is an elevated, pole-framed structure, nestled in the foothills of the majestic Thornton Peak; this mountain (1374 metres), sacred to the traditional owners, the Kuku Yalanji, and shrouded with mystery and legend, dominates the Daintree rainforest skyline. 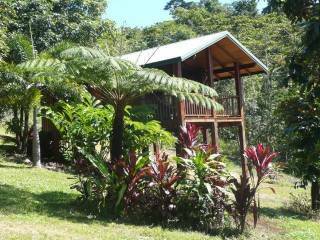 Tea Tree Cottage, located midway between the Daintree River and Cape Tribulation (20 mins north), in an area of the Daintree Coast renowned for its biodiversity and uniqueness as a refuge for rare, ancient and endemic flora and fauna, is an ideal base for exploring the World Heritage-listed rainforest, the Daintree National Park and, the somewhat underplayed jewels of the Daintree Coast, the quiet, secluded and pristine beaches. 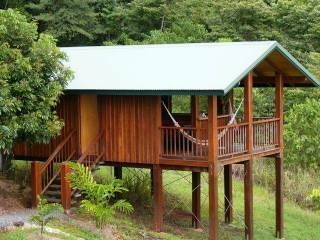 Flowing from the open-plan kitchen, dining and living rooms is a large, easterly-facing verandah providing expansive views across the Daintree Rainforest. The cottage takes further advantage of its elevated position by harnessing sea breezes enhanced by the anabatic influence of Thornton Peak. 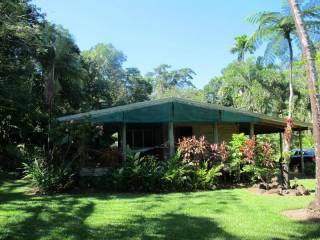 Tea Tree Cottage is a leisurely 2-2.5hr drive from Cairns International Airport and a 1 hr drive north of the internationally recognised resort town of Port Douglas. 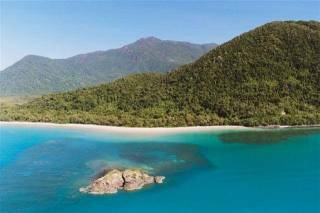 Whilst the property is fully self-contained, there is a choice of restaurants and cafes close by. Tea Tree Cottage is also pet friendly. All bookings confirmed upon full payment. Less than 28 days notice no refund. 28 days notice or more full refund less $100 admin fee. Upon confirmation directions and key collection will be sent to via e-mail. All bookings are confirmed on full payment. Credit Card Details will be held until inspection is taken out on property. (within 24hrs) Guests will be liable to pay for any damage caused by them.